I suppose I should start this post with Happy July! I have to be honest, I’m not sure where the first six months of this year have gone, but here we are at July so I suppose we should make the most of it! I’m certainly going to try! Regardless of what month it is, it’s time for Week In Review. I’m loving this more and more each week, in spite of the fact that I can’t decide how to approach it. Should it be Day to Day? Should it just be an overview? Do I tell all or keep some things to myself? I’ll keep working at it and changing it up a bit, maybe even half and half, until I find what feels most comfortable. Nevertheless…I WILL be a part of it. Be sure to stop by at Meghan’s Fun House…Clean Eats, Fast Feets to see what everyone else is sharing and of course leave some comments. Knowing it promised to be a crazy week and I was suffering from Crazy Hair, I headed out first thing for a hair cut. Came home and “naturalized” after that. 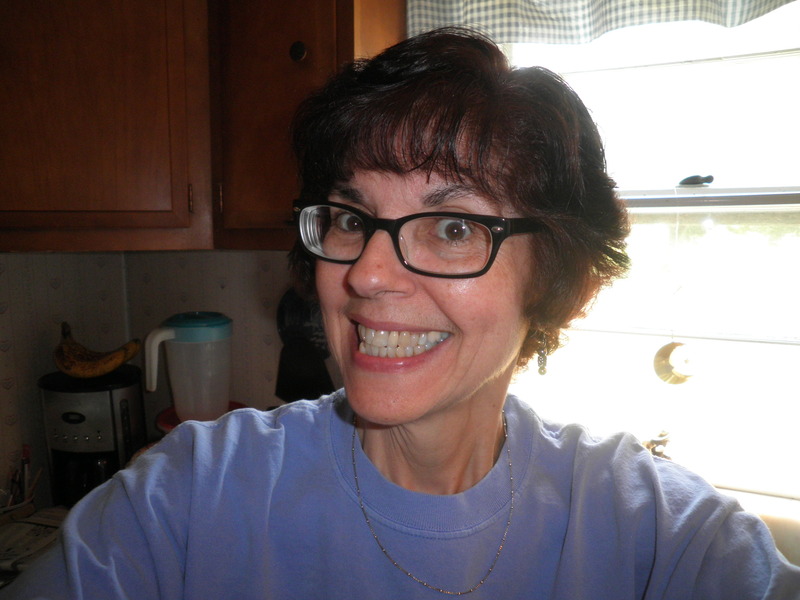 My friend Gail and I have a joke about “cheesy smiles.” She told me I needed to send her a “cheesy smile” photo of my new hair. You can all enjoy the joke with us! Turned out pretty good and as I learned as the week progressed, it looks Ok even if I don’t gel and blow dry after a shower. I like that in a haircut. Worked on yard sale prep most of the rest of the afternoon…So smart to do heavy lifting After you shower…oh well…it works out how it works out. We started out with a trip to the family doctor for Ralph to have his regular check up. We love our doctor and always enjoy seeing her. Out to lunch after that and then home for more yard sale stuff. This is where it gets hazy…I’m sure there was yard sale prep in here and we needed to make a quick trip to deliver some paperwork, then home again. I decided I needed to get started moving things for the yard sale out of the basement to the back yard because I’d never be able to move it all on Saturday morning. There was of course the issue of the constant monsoons lately. I had things in plastic bins, but was keeping my fingers crossed that the bins were water tight. Also, I had 3 bins of books which I Knew I couldn’t move as is. Came up with a plan. I took out an empty bin, then I’d partially fill 2 shopping bags and I could carry those up and out, then re-place the books in the bins. Worked like a charm! 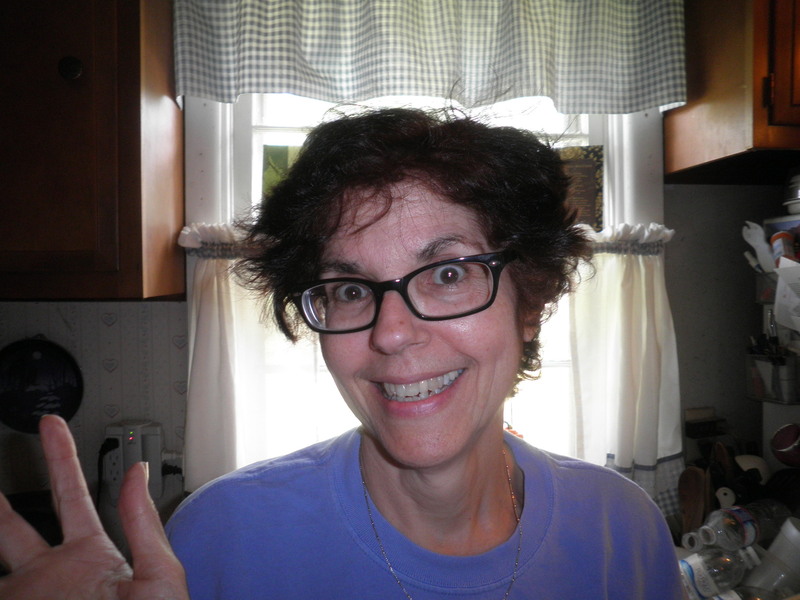 Got all of the books up the first day, but then I lost steam (AND found a tick on myself….ICK!!) Had to immediately take a shower and couldn’t think about going out there again, just then. The bins survived the Thursday monsoon so I continued with my plan. I got the rest of the binned up things out and continued to hope for the best. Some things couldn’t go out until Saturday morning so I had to be resigned to getting up pretty early. The day that had been giving me sleepless nights for a couple of weeks. Don’t know why I was so worried about it…I just was. This was a community wide yard sale and it was advertised as being from 9 am to 3 pm. I was up at 5 am with the coffee on, dressed and ready. 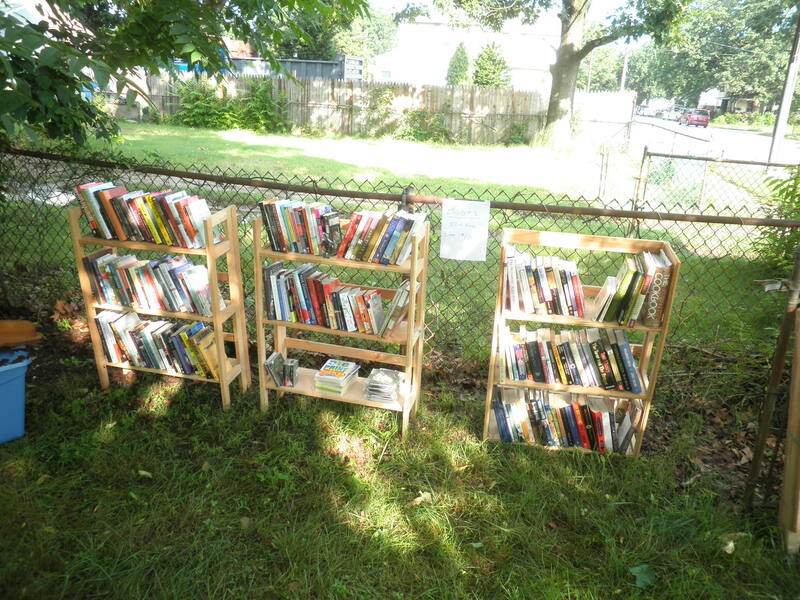 First I had to get the folding bookcases out of my side porch and out to the back yard where I was having the sale. That was fun…not. Then I got the rest of the things out of the basement which couldn’t be left out in case it rained….of course, it Did rain again Friday evening. Shelves set up and boxes moved into position for easier distribution. The grass was Very wet and my sneakers were soaked within 5 minutes. Oh well. Ele got here at about 7 am to get started. This was the result of our hard work. Sign made by Ralph, MANY yard sales ago. Did I say Books?! Actually, I thought I had more. Clothes…we had 3 of these. We spent all day out there….everything looked lovely…I made $40.00. But, it’s $40.00 more than I started with, didn’t cost me anything to do it. All of the books were packed into Ele’s car. Our town is trying to start a lending library in the Boro Hall and the left over books were my contribution. Another good thing I found out: I had planned on donating whatever was left over to a local thrift store that raises money for a special school. I called them and I first asked if there would be someone there who could help me unload the car…didn’t want to have to load And unload myself. The lady told me, “if you’d like to make an appointment we’ll gladly pick up your donation.” I was thrilled! Have to do a little shifting around from the bins to big plastic bags, but that’s easy compared to having to load it all up! I’m hoping to schedule a Tuesday pick up. I’m so excited. This will be such a plus as we clean out the house! Didn’t make much money, but found out something that will make life much easier as we progress with this clean out thing! Today is going to be a fun day, but a sad day. Today is our grandson Patrick’s graduation and going away party. The going away part is because he’ll be going into the Army in August. It will also be sad because his Dad, Bill is leaving (Tomorrow!!) to move to Boise, Idaho. I’m excited for him because he’s wanted to do this for a long time. My other feelings are hard to express. He’s Ralph’s son, but in the 22 years I’ve known him, he’s become My son, too. I’ll have to be strong this afternoon when I say Goodbye. It’ll just make me want to be in New Mexico that much more. New Mexico is a Lot closer to Idaho than New Jersey is. ‘Nuff said about that. Be sure to check out the other folks posting their Weeks In Review over at Clean Eats, Fast Feets. I’m going to go put on my stoic face. This entry was posted in Uncategorized and tagged Week In Review. Bookmark the permalink. Even if you didn’t make a lot of money, at least you got rid of a lot of things you didn’t need! And that’s awesome they’ll come pick up donations! Liz, I was so excited when I heard that! I’m going to do that again after I make another load of donations! Have a great day! Chris, we own 15 acres about 17 miles outside of Silver City, NM. We also own a house on a half acre on a mountain road within the city limits. It’s nothing fancy, but it is heaven to me. We’re hoping for next year some time. Two houses here to sell though…ugh. Wanna buy an old beaten up house cheap? 😉 This rain, heat and humidity is Killing me. I need to get to the warm breezes up on my hill!! You had a really busy week! LOVE that you donated your books! That’s what I do, too. I get so sad thinking about them sitting in boxes somewhere, when someone could be reading them. I love making sure that books are shared, Alex. I hate when books are mistreated too, I’m really strange that way. 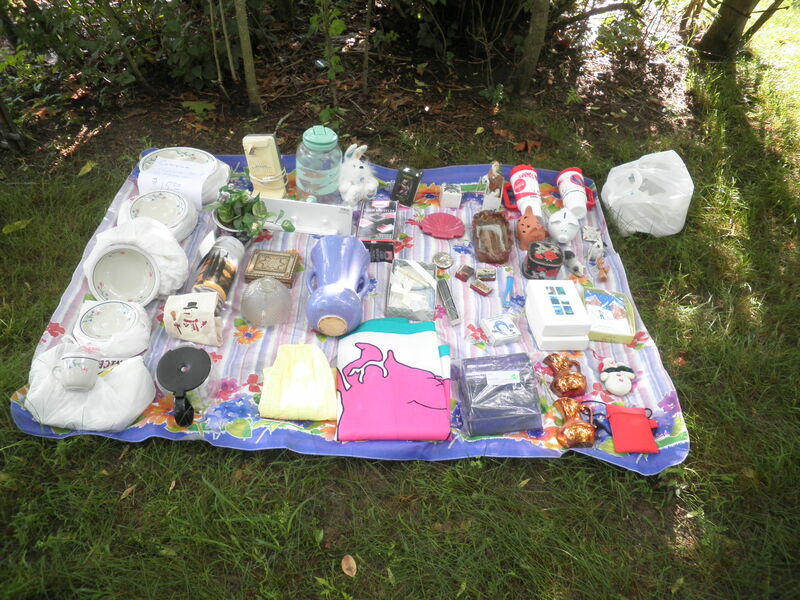 The way I figure about the yard sale is, I have $40 more than when I started, it didn’t cost me anything other than time and now I know a way of getting rid of things without too much effort that I wanted to get rid of anyway! Have a great day, Alex! Good luck holding it together at the graduation/good bye party. I’m sure it will all work out and before you know it, you’ll be in New Mexico which is closer. Great job on the yard sale Fran. It sounds like it all went really well and will be even better once the donation people come by. I know you worked really hard on it for the past couple months. P.S. Love the cheesy smile and the new do. Thanks, Meghan! You are such a positive influence and I appreciate it so much! If it ever stops raining here, I can get things organized to call for an appointment for the pickup. Glad you like my cheesy smile and I’m really loving the new cut. Just hope my hair dresser remembers it when I go back next time. Well I have the photo, right?! Have a great day! Hahahaha love the crazy hair photo. It looks super cute in the first one. And congrats on the $40! It’s definitely better than what you started with at 7 am. And I bet there was delicious coffee. Your boro lending library will be even better than my collection of young adult series! You’ll see my hair Live on Saturday! 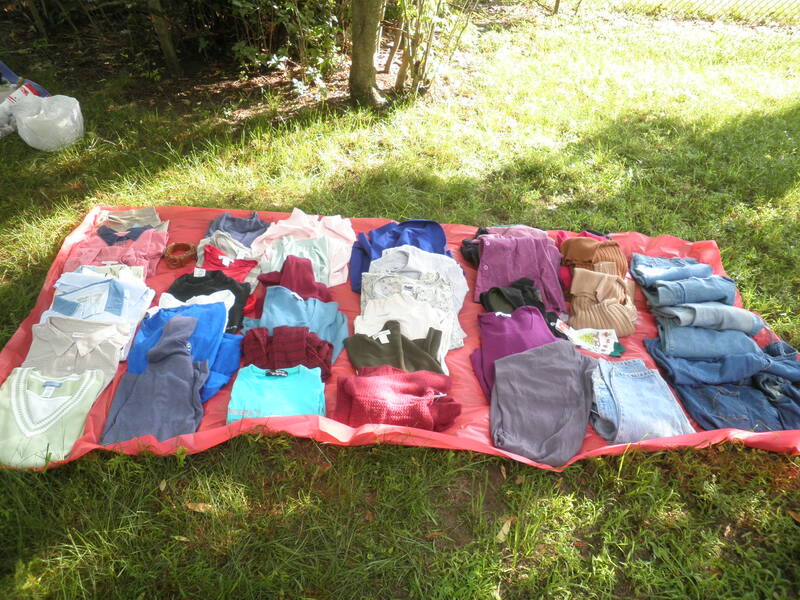 I’m pleased with the outcome of the yard sale…would have loved to make more but, ah well… I love your YA collection. You’ve broadened my reading horizons. Love the hat hair! 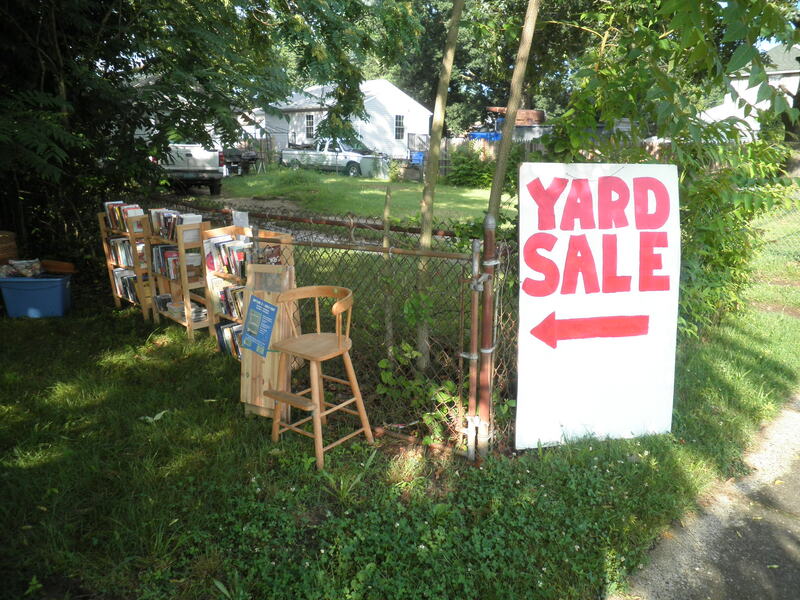 Glad made some money – I don’t have the patience for a yard sale but I admire people that do! I waffled back and forth about using that photo…glad you liked it, Stacie! The good thing is that what didn’t sell is being picked up by a local thrift store, so I’m happy. I never thought they’d pick up. They’re going to know my address Very well!